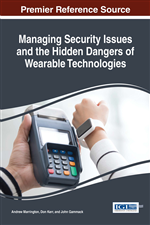 This chapter briefly introduces some historical and contemporary context before proposing a model course syllabus to implement a course in Management of Security Issues in Wearable Technology. The course syllabus is developed in line with the IS2010 curriculum recommended by the peak bodies (ACM and AIS) for a degree in Information Systems, Computer Information Systems or Management Information Systems. The design further follows the guidelines developed by the Accreditation Board of Engineering and Technology (ABET) that advocates that Course Learning Outcomes (CLOs) be developed for the list of topics covered by the material. In addition, the syllabus provides a basis for enterprise training relevant to managers and security specialists. The chapter also provides some general pedagogical guidelines on how each topic can be discussed and activities appropriate to the learners. It also uses Gluga et al. 's (2013) assessment criteria, based on Bloom's (1956) taxonomy to measure the depth of knowledge. Wearable technology builds on the vision that body-worn technology augments a human’s physical and analytical capabilities with computing power to engage in superhuman activities (Pedersen, 2014). Wearable technology refers to clothing or accessories that utilize the power of computing and electronics to enable the exchange data between objects without human intervention. The interoperability of these devices with existing technologies has made it possible to have a seamless exchange of data and a push toward connectedness. Since Thorpe and Shannon’s shoe-mounted roulette wheel prediction system (Thorpe,1998) and USA’s Defense Advanced Research Project Agency (DARPA)’s first digital glasses, much progress has been made to augmenting reality through wearable technology thanks to the rapid technological developments. Industry professionals attribute the progress of wearable computing to Steve Mann and recognize him to be “father of wearable computing” (Schofield, 2001). His contributions to the development of various elements of wearable technology range from topics in the technical aspects of wearable technology (Mann, 1997; Mann, 2003), to the impact on the social aspects, such as the loss of ability to have control of the information retrieved in surveillance (Mann, 2001).